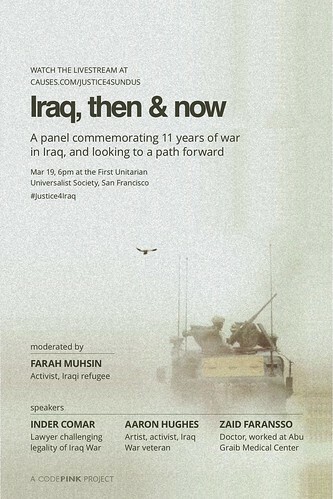 This event is meant to be an evening of remembering Iraq before, during and after the war and how the current day struggles of Iraqis, inside and outside of the country, continue whether in the form of surviving the violent attacks in the country or surviving life in foreign lands. Inder Comar: American lawyer who is representing Iraqi refugee and single mother Sundus Salih Shaker in a lawsuit against key members of the Bush Administration: George W. Bush, Richard B. Cheney, Donald H. Rumsfeld, Condoleezza Rice, Colin Powell and Paul Wolfowitz. Aaron Hughes: an artist, teacher, organizer, and Iraq War veteran, whose work seeks out poetics, connections, and moments of beauty, in order to in order to construct new languages and meanings out of personal and collective traumas. He uses these new languages and meanings to create projects that attempt to de-construct systems of dehumanization and oppression. He works with a variety of art, veteran, and activist organizations and projects including: Warrior Writers Project, The Dirty Canteen, The National Veterans Art Museum, Iraq Veterans Against the War, and The Center for Artistic Activism. Zaid Faransso: Iraqi refugee currently living in Northern California. Zaid was a medical resident at Baghdad’s Medical City, where he worked there till few years after the US invasion. Zaid moved to Jordan after the worsening conditions of the medical sector for both patients and doctors who found it to be near impossible to work under continuous violence. Zaid is now working as a pharmacy technician and a medical equipment instructor in the Bay Area. Farah Muhsin Al Mousawi (moderator): Iraqi refugee and activist living the Bay Area since 2008. Farah has worked with various non-profits in California, Chicago, and New York on issues relating to the war in Iraq and human rights. She is currently a member of Civilian-Soldier Alliance, Collective member of Courage To Resist, and an organizer with CODEPINK. Our event is being hosted by the First Unitarian Universalist Peace and Justice Committee. The event will be at the Martin Luther King Room at the First Unitarian Universalist Society in San Francisco (please click here for address). Doors will be open at 6:00 pm and our program will start at 6:30 and expected to end by 8:30.